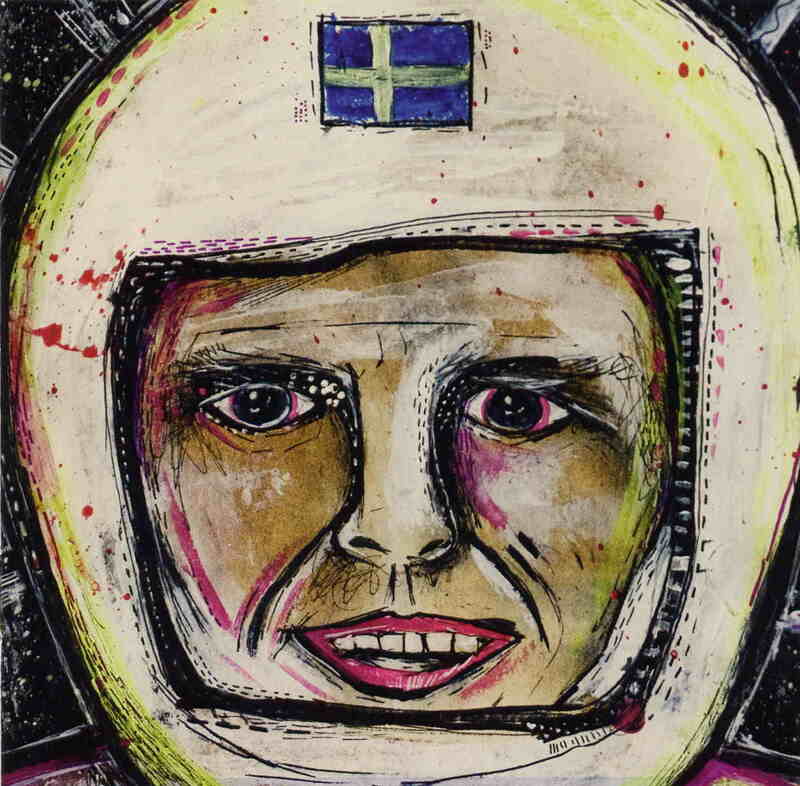 This album by this Swedish band from Göteborg is dedicated to the first Swedish man ever in Space (Christer Fuglesang). The CD features 12 musicians from several local bands contributing. You can still hear some a lot of the bands garage rock influence in this special space rock record that the band has put out but this is really something different for them but also amazing stuff. The CD starts with a short intro piece with some cool organ. This opens up into the track, Mother someday I’m going to be an Astronaut. This is a high energy almost punky space rock freakout track with cool spacey wah wah guitar, loads of spaced out synth sounds and effects for the first 5 minutes before the vocals kick in towards the end and the track becomes more organ driven. Great track. In the Footsteps of Gagarin is very organ driven but has a melodic spacey slowly building track with amazing keyboards before the guitar solo kicks in and they rock out. Trapped on Earth starts with some acoustic guitar, and is a nice change of pace and a great number, which really takes off. It is great combination this 60’s farfisa organ and all the spacey stuff. Go now my friend (Out into Space) again starts off slowly with lots of spacey stuff slowly being added to the slowly evolving track with a simple repeated vocal line. The next track with the funny title, That is the wrong bolt, Christer, Standby, is a short track with some actual samples from NASA, maybe?? Ministers of Space is a 9 minute track and is very hypnotic at times. The really reminds me of Circle. The CD ends with The Grasp of the King’s hand is not Enough and this has a bit of Swedish folky feel to it and a very nice beautiful and melodic track. Pretty cool CD. The Movements are a Swedish band, usually found playing a blend of garage rock and psychedelia with touches of space rock. However, inspired by Sweden's first astronaut, Christer Fuglesang, who just blasted off on his second mission into space on August 28th of this year (the first one was in 2006), they decided to fully embrace their space rock leanings for their latest album, For Sardines Space Is No Problem. This is a concept album about Fuglesang, his life and his journey into space, so I'm guessing the opening cut, A Birth Under the Northern Sky, is an ode to his beginnings. It's a majestic, but also haunting organ and synth driven piece, with a slow and stately beat, culminating in the sounds of a baby crying. It sets a reverent tone for the album, which is a lovely beginning, but doesn't really hint at the humour, craziness, and all out rocking that is to come. A young boy utters the title of the next song, Mother, Someday I'm Going To Be An Astronaut, and the band launches into a fury of space rocking with wild guitars and gurgling, bubbling synths, all somewhat reminiscent of some of the jams of Space Ritual era Hawkwind, before it takes a left turn into a Gong inspired vocal part near the end. In the Footsteps of Gagarin borrows a trick from Pink Floyd's Wish You Were Here, starting with a buzzing radio transmission, and the main riff of the song beginning as a distant and static laden signal, before it kicks in to high fidelity. The underlying riff is near orchestral, with cosmic synths wooshing throughout as tripped out, distorted vocals sing the main melody to great effect. In true Hawkwind tradition, there's a strummy acoustic piece on the album as well, this in the form of Trapped On Earth, with a very catchy lullaby-like melody played on what sounds like a Glockenspiel. But wait! Half way through it blasts into an energetic space rocker, with the same chord progression and melody (this time played on cosmic synths), and an absolutely smoking organ solo. Go Now My Friend (Out Into Space) has a laid back rhythm with gentle slide guitar and soft sine wavey synth line and a kind of old-timey Caribbean sound to the vocals, but it gradually gets stranger and spacier until it finally culminates in the hero blasting off into space in a sonic freak out of countdowns and crazy interstellar sounds. That Is the Wrong Bolt Christer, Standby is a short, dreamy instrumental, perfect music for spacewalks, complete with authentic radio transmissions from Earth and the astronauts. Ministers of Space is the longest track on the album (at just over 9-minutes) and combines a Neu-style motorik rhythm with flute, weird space electronics and other effects for a totally hypnotic journey that builds slowly and inevitably to another dazzling space rock jam. It all brings us to the final track on the album, The Grasp of the King's Hand Is Not Enough, a blistering, melodic minor key psychedelic rocker with a distinct 60's influence that finally dissolves into a stretched out rumbling and cosmic finale.There's not a single misstep on this album, it's a solid effort from start to finish, achieving a perfect blend of catchy song writing with instrumental space rocking madness. And just a few days before I wrote this review, it was confirmed that Christer Fuglesang had taken a copy of it with him on his current mission to the International Space Station, making this the very first space rock to be actually played in outer space. Very cool! If you're a space rock fan, this is an album you can't miss! Highly recommended!